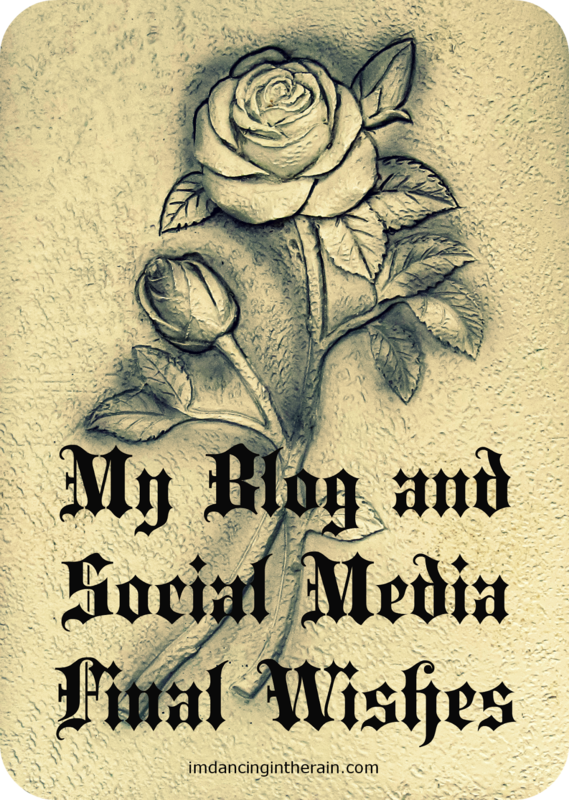 What would happen to my blog and social media accounts in the event of my untimely demise? What would I want to happen? These are questions I started thinking about after reading a recent post by my friend Greta at g*funk*ified. It's very disconcerting to continue seeing the Facebook page of someone who has passed. Well, at least I think it is. My uncle died two years ago but his Facebook page is still alive. His name was Mark, the same as my husband, so every time I go to tag my husband in one my posts, my uncle's face pops up. On the other hand, a fan page was created for my friend Emily after she passed in 2007 as a way of giving her loved ones a place to "visit" her and share memories if we wanted. For some reason that is more comfortable for me. As a blogger and social media enthusiast I have "put myself out there". I have steadily grown my following and made some friends. I'd like to think that if I were suddenly gone, someone would wonder what happened. I know I do when someone I've been following seems to have dropped off the face of the earth without telling anyone anything. I have gone searching for people only to find their blog or twitter or whatever just gone. What the hell happened?? I would want someone to post on my blog explaining what happened. People need closure! I would also want them to post to my Twitter account and Facebook fan page at least. I can write down login info and put it in our safe, but basically, if you open up Chrome on my computer, I should be automatically signed in to almost everything. I think my blog should be left up at least until the URL is supposed to be renewed. Before it goes away, I would love it if someone turned my blog into a book for my kids. Perhaps have my Facebook account memorialized. All other accounts should probably be canceled, deactivated or whatever at some point. Granted, considering Mark's health status I should probably tell someone else the specifics too (or just the combo to our safe). It's odd to have to think about such things, but our online lives are becoming more and more prolific, so I think this is most definitely something one should take into account as part of their end-of-life considerations. Of course, I have no intention of going anywhere any time soon. I intend to get quite old and wrinkly, and take you along for the ride thankyouverymuch! Have you ever thought about what would happen to your online presence postmortem?